When searching for passwords in Team Password Manager you can use special operators that can help you refine your results. Search operators are special words that allow you to find passwords quickly and accurately. The main passwords list search box. The passwords search box inside a project. My Passwords list search box. See below a list of all the operators you can use. These operators are available since version 4.50.100. Search is always case and accent insensitive. Since v. 6.63.136: If the string being searched is composed of more than one word, the search will match if all the words are found, regardless of their position or if they have other words in between. Example: name:"new api" will find passwords with the following names: "This is a new password that uses the api" and "APIs for new service". You can combine operators to perform an AND search. Example: file:.pdf is:favorite (search my favorite passwords that have pdf files). Use "" to group words in the same operator. 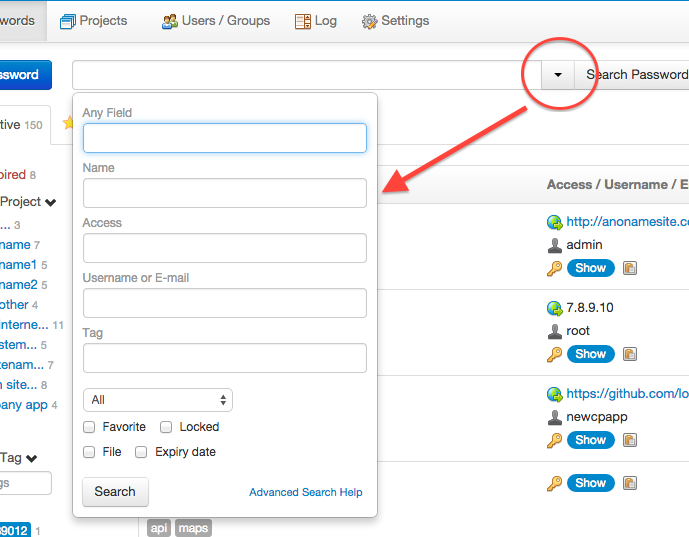 Example: name:"server ftp"
By default, searches are performed with beginning and ending wildcards. In SQL it's like this: LIKE '%string%'. This will search any text that contains any part of string. If you want to search for an exact match you can use [ and/or ]. Example: username:[root] will search for passwords that have root (and only root) as username. You can use both  (exact match), only [ (strings that begin with) or only ] (strings that end with). Example: email:[info@ will search for passwords that begin with info@ in the email field. You can use these operators with the API when searching for passwords (GET /passwords/search/urlencoded_string.json) or my passwords (GET /my_passwords/search/urlencoded_string.json). Since v. 7.82.196 you can search multiple tags: when using the "tag:"" operator you can search passwords that have several tags separating the tags with a comma, like this: tag:"t1, t2, t3". This will search all the passwords that have tags t1, t2 and t3. Note the use of quotes as we have spaces between the commas and the tags.